CivilPolitics’ mission is to educate the public on evidence-based methods for improving inter-group dialogue, with evidence defined broadly to include academic studies, empirical studies of community interventions, and also the practical wisdom learned by organizations that are bringing people together in the community. As part of this last area of evidence, we are asking our partners in the community to answer a set of semi-standardized questions designed to help us learn the common themes that run through successful community work. If you would like to have your organizations’ work profiled, please do contact us and/or fill out this form. This is the third post in the series detailing the experiences of Suzanne Soule, who worked as the Director of Research for the Center for Civic Education for over a decade. What is the organization/group that you worked with? What is it’s history in terms of getting involved with improving community relationships? I worked as director of research for the Center for Civic Education for a little over a decade. We worked with youth in the United States and Emerging Democracies to try to get them to be engaged citizens, through programs like We the People and Project Citizen. Most of the students in these countries did a program called Project Citizen. Despite all the talk about uncivil discourse in the US, we are a lot further along than these emerging democracies. We at least have a forum and a conversation, whereas in a lot of these places, there is no forum and people may just walk out of the room, when confronted with conflicting opinions. Most of the best lessons for resolving inter-group divisions could be learned from our work with post-war emerging democracies. We did research in Boznia/Herzegovina, Palestine, and other emerging democracies that had a history of totalitarianism that had issues with transparency and corruption. In these places, there is not a history of open dialogue, so there was a lot to be learned in creating such a space. Young people would conduct research on a problem in their community that they chose and propose a solution based on their research to elected officials. In a place like China, they may also go to the media and increase pressure on officials. We partnered with local organizations as there is a lot more autonomy at the local level for change, within emerging democracies as well as places like China. This wouldn’t have worked without the local partners as you can’t do these things from the outside. Students vote on which problem they should address. There would be winners and losers and some students would end up on a project that they didn’t necessarily care about. The teachers worked to give them a reasonable role in the project as there is often a difficult moment where their chosen issue has lost, but in all the years I worked on Project Citizen, I’ve never noticed a time when a student wasn’t able to eventually contribute. The contribution may end up large or small, but they all end up contributing something, even if it isn’t exactly the issue they would have chosen, which has implications for getting people to work together on collective action from different perspectives. What I think works well in getting a student to work towards a group goal that they didn’t initially endorse is to figure out what a students’ skills are and seeing how that relates to the problem. If they are good artists or good interviewers, how can we help them shine so that they can do really good work leveraging those skills and buy in. They also work together in groups, so seeing the others inspired in the group works wonders. Over time, their initial ideas about the ideal project fade and the group project gains momentum. In conversations with adults, it also helped that the students did a lot of research, so the adults were often convinced by the students because of their empirical knowledge. Students were trained to evaluate the status kuo and were often critical of existing policies. and able to effect change because they had lots of evidence. Public officials who would be threatened by adults making the same recommendations were far more open to a group of 12 year olds. They were much more open. They often got a lot more of what they wanted from the public officials than we thought was possible. Youth often melts the hearts of hardened people…the heart opens and there is an element of surrender. It doesn’t work if the problem is chosen from the outside. There needs to be some time spent on finding out what they care about themselves with a lot of listening and open dialogue. I had to stop going in with a questionnaire and just listen to what concerned them and what was really problematic. Often they would come back to the problems I listed, but there was more buy-in if they came up with it themselves. There was more discourse and willingness to do the work as they were invested rather than thinking that there were these “Americans” coming in telling them what to do. As far as the public officials we talked to, if there was any possibility that the officials would be shamed or put on the spot, then it would close dialogue. But if there were a possibility for positive PR or an award…or to talk to their own constituents/voters, people were very open. Having people far removed from them telling what to do would also close things down. Providing Information on Common Goals/Threats, Reducing the Perception of “Zero-Sum” competition, (any win for one side = a loss for the other side), Showing Examples of Positive Relationships , Reducing the Perceived Differences Between Groups, Showing Examples of Cross-Group, Unexpected Agreement or Disagreement , Reducing Certainty of Individual Beliefs, Increasing Cross-Group Personal Connections through Fun, Meals, Talking, etc.. I would like to emphasize listening at the outset. Careful listening that leads to finding common ground. It gives space for people to realize that they often have the same problems in divided societies and it improves relationships for people to realize that people unlike them have the same issues. It humanizes the other side. CivilPolitics’ mission is to educate the public on evidence-based methods for improving inter-group dialogue, with evidence defined broadly to include academic studies, empirical studies of community interventions, and also the practical wisdom learned by organizations that are bringing people together in the community. As part of this last area of evidence, we are asking our partners in the community to answer a set of semi-standardized questions designed to help us learn the common themes that run through successful community work. If you would like to have your organizations’ work profiled, please do contact us and/or fill out this form. This is the second post in this series, where Mark Gerzon, Director of The Bridge Alliance, shares lessons from his 25 years bringing people together. What is the organization/group that you represent? What is it’s history in terms of getting involved with improving community relationships? The Bridge Alliance is just founding, but I have been active in the field for a quarter of a century. We’ve incubated numerous projects like America Speaks and the US Consensus Council. One of the things the past 25 years has thought me is the limitations of any single project, approach, book, tool, practitioner, or website. After 25 years, I felt a yearning to help the field mature and become integrated into a coherent movement or soul because I want to have an impact on the American people and my frustration is that the political system has not benefited from this work. If anything, the political process has deteriorated while this field has been growing. I want to close this gap so that the system can receive the benefits of the work being done, through the Bridge Alliance. There are many specific strategies that one can read about on our website, but one specific goal is that by the end of 2016, we want a significant percentage of the American people to be familiar with a third political narrative. The first narrative might be that conservatives are better and have the answers. The second narrative might be that liberals are better and have the answers. The third narrative is that we have to work together across the political divide to meet the challenges facing our country. Americans working together is this third narrative. 100% of people may not become aware of this as not even 100% follow politics in any form, but if a significant number are at least aware that there is a third narrative, they will no longer be living in a black and white world, but rather living in a technicolor political world. An example of a specific project we have done that can facilitate this awareness is the set of Youtube presentations we have made available under the Center for Transpartisan Leadership. The idea was to provide short youtube presentations as an online faculty so that American citizens can meet all the people in this field. The presentations include personal testimonials about what led individuals to be interested in this field as well as practical lessons on how people have created change in their communities. We have about 20 of these videos going up by the summer, with 12 online now, and the eventual goal is to have 40 or 50 up. My best answer to that question is detailed in my book, Leading Through Conflict, which reflects the panoramic view I have had within this field, through methods like appreciative inquiry, generative dialogue, non-violent communication, and more. The table of contents list 8 tools that I have found helpful across techniques (Integral Vision, Systems Thinking, Presence, Inquiry, Conscious Conversation, Dialogue, Bridging, and Innovation). That being said, I’d like to expand on one recommendation that readers of this post may find helpful that relates to our current efforts. It had been written about as Systems Thinking or Systemic Change previously. The best evidence-based recommendations for improving inter-group relations arise when academic research and real-world case studies echo each other. There has been ample evidence of how shared (superordinate) goals can reduce inter-group tensions in the psychology literature, and this research has spawned events and programs designed to put this research into practice. We can have even more confidence in this recommendation when we see shared goals uniting people across moral divisions, without any influence from the research community. Recently, the New York Times wrote about one such case, where the conservative Koch Industries and the liberal Center for American Progress are working together toward a common goal: reforming the nation’s criminal justice system. Koch Industries, the conglomerate owned by the conservative Koch brothers, and the Center for American Progress, a Washington-based liberal issues group, are coming together to back a new organization called the Coalition for Public Safety. The coalition plans a multimillion-dollar campaign on behalf of emerging proposals to reduce prison populations, overhaul sentencing, reduce recidivism and take on similar initiatives. Other groups from both the left and right — theAmerican Civil Liberties Union, Americans for Tax Reform, the Tea Party-oriented FreedomWorks — are also part of the coalition, reflecting its unusually bipartisan approach. In the face of important issues, people who were previously divided are indeed capable of putting aside previous differences. For example, political scientists have clearly documented how war brings out nation together in support of our president, across party lines. These shared goals are actually more common than one might think. We all have an interest in reducing poverty, increasing employment, improving education, and improving public safety. It is often simply a matter of focusing more on the policies that can help us achieve our shared goals versus the elections where only one side can win. ps. If you’re interested in having a conversation about the issue of criminal justice reform across party lines, I’d encourage you to check out the work of Living Room Conversations, whose work we have previously featured here. I recently attended the 2015 meeting for the Society of Personality and Social Psychology, which is the main gathering for academic social psychologists. Here, psychologists gather to share their latest and greatest new research. My goal was to find as much research as possible that may be of interest to our Civil Politics readers (e.g. research relating to bringing together groups across moral divisions in their community). The meeting can be rather overwhelming as there are hundreds of panelists and thousands of posters competing for your attention, each of which may contain several novel research studies. One of my favorite sessions from this year was a panel entitled: “Finding Patterns in a Maze of Data” and emphasized that “Robust discoveries require the recognition of clear patterns that exist across a wide range of data. By finding these patterns, researchers can construct integrative theories that capture broad fundamental truths.” (full program here) While there may be thousands of potential findings to report, they are all often different takes on the same themes and it is in this convergence, across methods, samples, and research groups, that lends credence to any research discovery. At Civil Politics, we use this same method to gather evidence for our recommendations across existing research, new research, evidence and experience from practitioners, and patterns in the news, with convergence leading to greater confidence that improved interpersonal relationships and emphasizing cooperation over competition are indeed robust evidence-based recommendations. Accordingly, below are a number of new research findings that support and provide nuance as to our existing recommendations, as well as findings that suggest new potential recommendations. The contact hypothesis, which posits that interpersonal contact under the right conditions can reduce intergroup tensions, was developed 60 years ago, but research continues to this day. 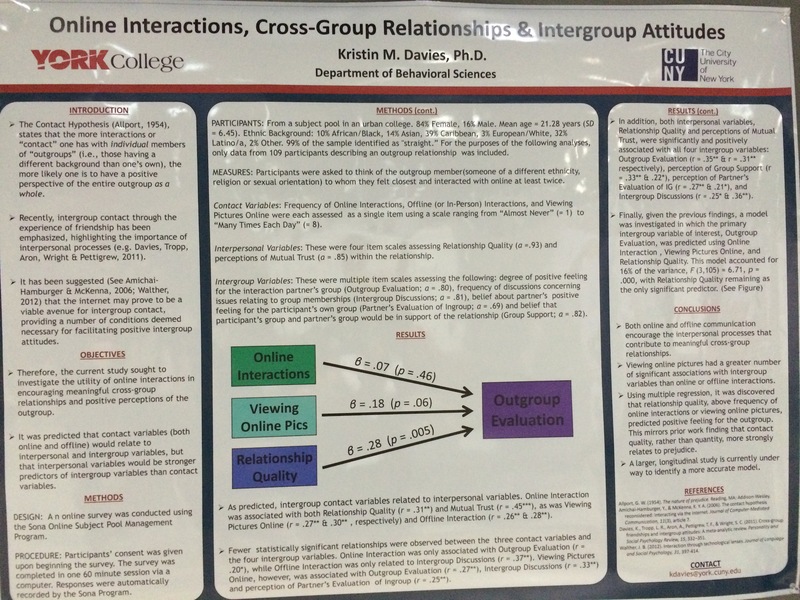 For example, this poster by Kristin Davies of York College, showed how contact can extend to the online world, such that online interactions, especially high quality interactions, with members of outgroups was associated with positive feelings toward those groups. The above poster is correlational, so there are many explanations for the relationships found, but when put in context with all the other research on the contact effect, both at this conference and in the literature more broadly, the patterns are quite clear that positive contact can indeed improve inter-group relations. Another poster from researchers at UCLA used an experimental paradigm and showed a similar effect using a different target group (gender-atypical or overweight individuals), with visual exposure to these groups reducing prejudice. A related study led by Curtis Boykin at UC Berkeley, shows how surveys of people of different religious backgrounds indicates that the quality of interactions with people of other religions may a persons’ attitudes toward people of differing religions. 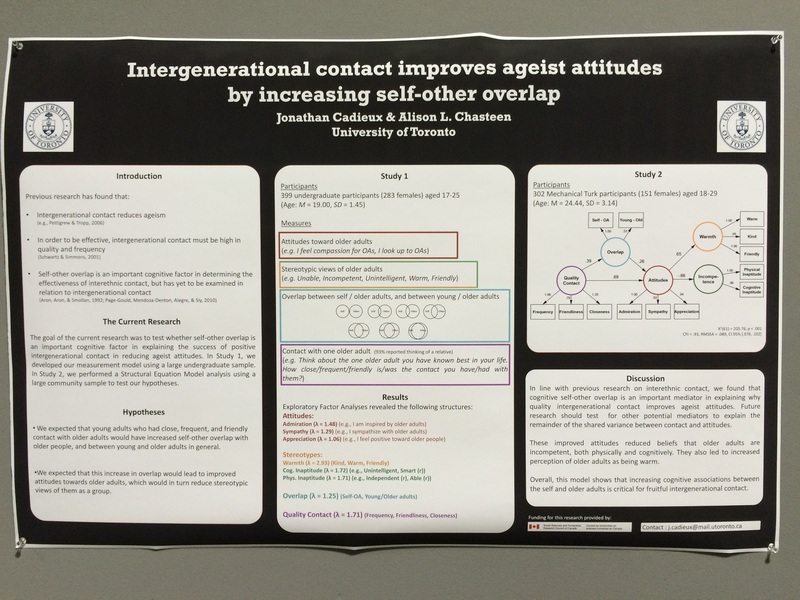 This next poster led by Jonathan Cadieux and Alison Chasteen at the University of Toronto, sought to refine the mechanism whereby quality contact with older individuals led to less ageist attitudes, showing that measures of self-other overlap with older individuals helped explain this decrease. It’s worth noting that the above studies, all in-line with existing research, used varied samples (students vs workers on Amazon’s Mechanical Turk), methods (surveys vs. experiments), and target groups (by age, race, religion, and body type) and all came to similar conclusions. It is this kind of convergence that gives us confidence in recommending improving cross-group relationships as a means toward bridging inter-group divisions. How can we improve cross-group relationships? Mere exposure is not enough and the above studies emphasize the quality of contact across groups, an idea that has been explored previously in the literature as well. For example, the below poster, led by Sara Driskell and Mary Murphy at Indiana University, shows how uncomfortable/negative contact such as being forced to touch a stranger, can actually lead to worse inter-group attitudes. Similarly, this study from Kathleen Oltman at Yale, shows how even imagined negative contact with an individual of another race can lead to more negative attitudes toward the whole group. The above study did not find that positive imagined contact had the opposite effect, as the effects from negative imagined experience were greater. This has been found in previous literature, where negative experiences are more impactful than positive experiences, which is something that people bringing groups together should be aware of. The below poster, let by Pirathat Techakesari of the University of Queensland, explores this asymmetry in more detail. In an experience sampling study of attitudes of White vs. Asian Australians, they showed that negative experiences may be more impactful for majority groups, but that this asymmetry was not found for minority groups. Clearly those seeking to bring groups together should avoid exacerbating differences through negative inter-group experiences. Another potential negative effect that I may not have thought of was presented by Fabian Schellhaas and colleagues, as they expanded on previous research that showed that positive cross-group contact can undermine the desire for disadvantaged groups to mobilize to change the status quo by showing that this happens more when the individuals involved are perceived as typical members of their group. Finally, the below meta-analysis of extended contact effects, which involves a line of research that shows that seeing other people’s inter-group friendships can improve one’s own inter-group attitudes, further emphasizes the importance of relationship quality, as opposed to mere contact. In summary, while no study is conclusive and all have flaws, including these, there is a great deal of convergent evidence from new research that confirms and expands upon what we already knew from previous research, specifically that positive experiences with members of other groups leads to better inter-group attitudes. Our second main recommendation for improving cross-group divisions is to foster cooperation over competition. A number of studies at this conference also confirmed and expanded upon previous work in this area. Competition often arises from scarcity, threat, and the resulting competition for limited resources that can stave off these threats. As such, consistent with previous research, reminders of one’s own mortality and the possibility of death are detrimental to inter-group relationships. Here, Israeli soldiers who were reminded of their mortality showed decreased positive attitudes toward Israeli-Arabs. More generally, a simulation using public goods dilemmas, led by Bobby Cheon of Nanyang Technological University, showed how threat can lead to an adaptive response where individuals favor their ingroups over others. Similarly, the below study led by Amy Krosch at NYU, used psycho-physiological measurements to show that scarcity leads to greater lag in encoding other-race faces, suggesting that this may be a mechanism for the dehumanization that often precedes inter-group tension and violence. Threat and the competition for limited resources does not have to involve physical goods. Many wars have been started in part due to collective humiliation and the below study led by Liesbeth Mann of the University of Amsterdam, also indicates that group based humiliation can lead to aggression, with the caveat that this may be more true for higher status individuals. In contrast, in the absence of threat, seeing cooperation amongst those from an out-group actually may lead to a perception of opportunity rather than threat, as this study by Shiang-Yi Lin and Dominic Packer from Lehigh University showed. Indeed, the lack of a competitive situation can often change the meaning of many things that would otherwise be perceived as threatening. One interesting talk from the “Finding Patterns in a Maze of Data” symposium by Adam Galinsky at Columbia, showed how competition can lead the same forces that bind us (glue) to fan the flames of conflict (gasoline). Specifically, intergroup contact, similarity, flattery, and perspective-taking can all actually lead to greater conflict in a competitive context, even as they bind people together in cooperative contexts. The above research naturally begs the question as to how we get more cooperation and less threat. One method that is often used is to prime a collective goal or identity that can be shared across groups. Consistent with this previous research, the below study led by Abraham Rutchick at Cal-State Northridge, suggests that greater perceptions of a super-ordinate identity (e.g. we are all Americans), leads to more bipartisan behavior. If threat increases competition, and therefore increases intergroup tensions, it stands to reason that situations that reduce threat will increase cooperation. For example, the below study by Rodolfo Barragan of Stanford showed how increasing perceptions of the goodness of others may increase cross-group collaboration, perhaps by instilling a more global superordinate identity. At a more psychological level, the below study led by Mollie Price at the University of Missouri showed how mindfulness may reduce one’s anxiety and threat sensitivity, leading to improved inter-group attitudes. Similarly, feelings of hope, which may be helped by perceptions of a world that is dynamic and changing, can also lead to an improved desire to cross group divisions, as this work led by Smadar Cohen-Chen of Northwestern shows. One way that competition ensues is when conflicts become moralized. Here, differences are no longer matters of preference, but take on an existential quality, where the beliefs of another group threaten one’s identity. 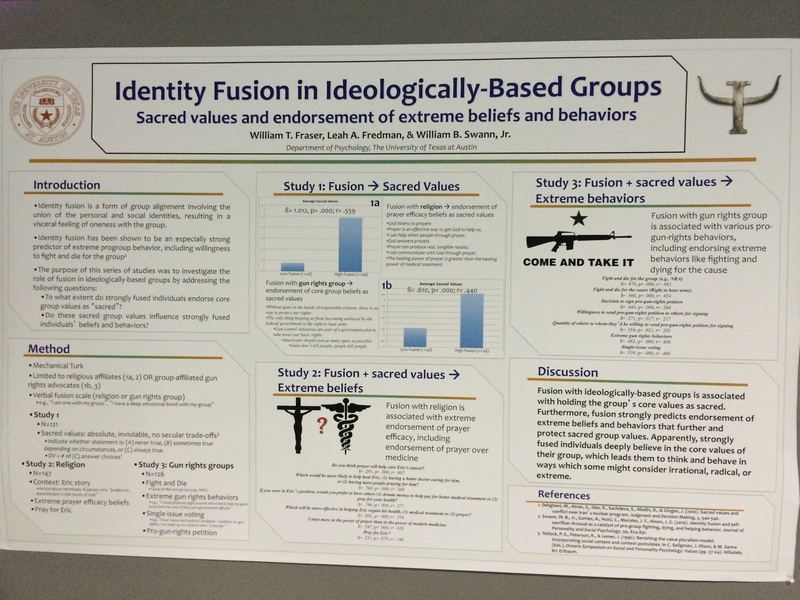 In the below work we see work led by William Fraser at UT-Austin, on how people who have are fused with ideological groups tend have extreme beliefs and behaviors that may exacerbate inter-group tensions. In addition, this study led by Tamar Kreps at Stanford shows how people who moralize an issue may see the world through the lens of that issue, making it harder to bridge intergroup divisions. As a result, when we have competitive situations between two morally conflicting groups, we see not just a difference of opinion, but a dehumanization of the other group. In this study led by Joanna Sterling at NYU, we see this dehumanization measured in terms of less higher order cognition attributions to the other side. This extremity, singular perspective, and reduced consideration as to the humanity of the out-group can lead to violence. In the below picture, Matt Motyl, professor at University of Illinois and a board member of Civil Politics, is having work by Nate Carnes from UMass-Amherst explained to him. The study shows specifically how moral motives can be associated with endorsement of intergroup violence. The above recap represents just a percentage of the research presented at SPSP 2015, given that multiple sessions occur at any time. While each year, much new research is presented, a great deal of this research supports old ideas, just in new contexts. For example, while past researchers may have studied race in the context of school integration, these researchers are studying body image in the context of online settings, yet the variables they use – specifically positive experiences with other groups – remain the same. Similarly, the idea that tensions often arise between groups that compete with each other for scarce resources, whether they be a piece of land or jobs or a sports championship, is an old line of research. However, new mechanisms that increase or reduce threat/competition are being explored as there are many avenues toward fostering cooperation between groups. Hopefully this overview of some of the more pertinent new research can both confirm existing ideas that people trying to bring groups together already have and inform some new ideas as well. Navigating the scientific literature can be difficult as there is so much research being produced these days and so much controversy as to what findings are “real”, that it can be hard to know what evidence-based recommendations to follow. In order to help provide clarity to the journalists, organizations, and others who get information from Civil Politics, we would like to make two main recommendations. These recommendations are not exhaustive and there are certainly other avenues of research. And they are broad, such that the way that they are practiced may vary depending on the situation. 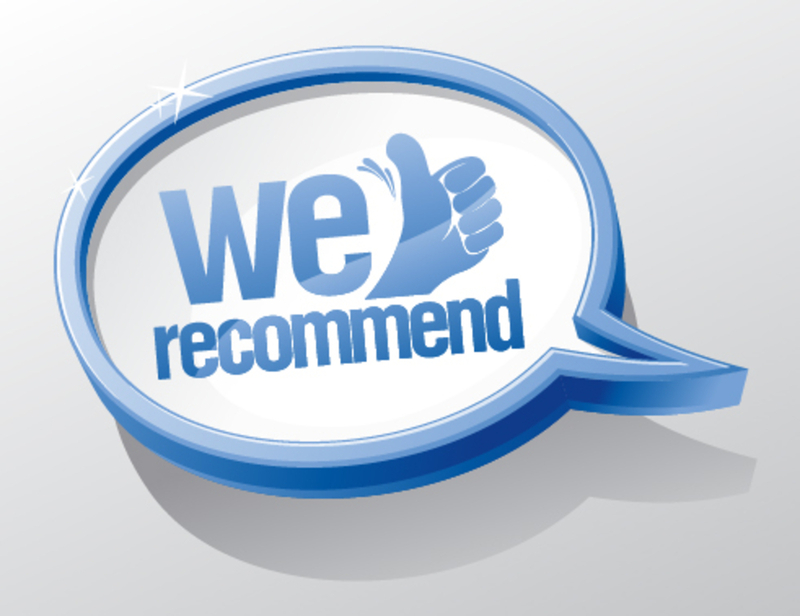 But these recommendations are also broad in terms of the evidence that supports them and this same breadth also provides practitioners options as far as how to effectively practice these recommendations. 1. Improve inter-personal relationships – There is a rich psychological literature on how positive contact between groups increases the likelihood that greater cooperation and less demonization across groups will occur. This can occur either between individuals or at the group level, whereby individuals see that people of their group are getting along with others in the other group (known as the extended contact effect). The psychological research on this phenomenon dates from the civil rights area, and continues to be replicated in labs across the country to this day, such that we can have confidence in it (see more research here). Evidence for the utility of promoting positive relationships between groups is not only found in the psychological literature, but also in prominent examples of cross-group cooperation (e.g. Reagan and Tip O’Neill or more recently, Patty Murray and Paul Ryan) and in the successful practices of numerous organizations that work in the community such as A2Ethics, Living Room Conversations and The Village Square. Intuitively, we all know that relationships matter as much as facts, and so organizations seek to build culture, doctors get to know patients, salespeople get to know clients, and diplomats work to build relationships as well. Yet sometimes in the heat of a morally charged conflict, we may start to see the other side as personally repugnant, and it is exactly at these times when relationship building needs to occur as it is hard to find common ground with someone you find personally reprehensible. Many inter-group conflicts actually occur between people who are actually quite alike in many ways (e.g. baseball fans, political junkies, bloods and crips, etc.) and the opportunity exists to take advantage of what people have in common to forge better relationships. And once the intuitions and emotions are pulling us to cooperate, our views of the facts often follow. 2. Emphasize cooperative goals vs. competitive goals – In most conflicts, the extremists on each side will seek to emphasize the enduring intractable nature of a conflict. Consider how both militant Islam and those who are openly anti-Muslim seek to characterize the divide in the same way; as a fundamental zero-sum conflict, and the same could be said of how the far-left and far-right seek to characterize American politics as fundamental battles between good and evil. Yet there are often goals that are shared by both groups that lead to cooperation, at least amongst those who are in the vast middle (e.g. it is only the shared goal of avoiding government default and shutdown that often leads to the passing of legislation). There is a vast amount of psychological research that relates to how competition for limited resources leads to inter-group conflict (Realistic Conflict Theory), and researchers are constantly showing how variables that relate to this paradigm (e.g. increased threat or decreased scarcity of resources) impact inter-group relations. As with our first recommendation, the research in this area is bolstered by the experiences that organizations have had in creating cooperative settings. For example, the Village Square has held several successful events leveraging Jonathan Haidt’s Asteroids Club paradigm where partisans seek to recognize problems that both sides can agree are real issues and Living Room Conversations attempts to create a personal setting where people can work together on goals that everyone can agree upon: safer communities and reduced prison costs. There are also many examples from the news where cooperation occurs when a larger goal can be identified (e.g. this recent Politico article where George Soros and Bill Koch work together on prison reform). We all know that competition breeds animosity, even amongst those who would otherwise be friends, as evidenced in every sports rivalry across the country. Yet just as sports fans unite to sing the national anthem, so too can those who find themselves divided seek to consciously remember the larger groups and goals that can indeed bring them together and emphasize those. We are periodically asked by journalists, organizations, and site visitors about crossing moral divisions and are hopeful that these two simple recommendations can help cut through what can otherwise be a rather opaque literature on evidence-based methods. Both of these recommendations are supported by dozens of articles and hundreds of studies, as well as countless hours of work and experience by practitioners. At some level, these techniques are intuitive and are things we already know…but they are also things that we often forget in the heat of a debate, and we are hopeful that reminding people to consciously apply these techniques can make a difference. DICO is designed to allow other systems to access and incorporate the information provided by DICO to enhance other institutional processes of Congress through a central database. Using DICO, a system can identify cross-partisan coalitions that are based on shared interest in particular issues. You can read more about the winners and contest here. Social psychology teaches us that the mere desire to cooperate doesn’t always win out over situational barriers. Improving cooperation may be a stated desire of both parties, but actual cooperation may require the creation of new tools that facilitate a cooperative environment, such as those identified in this project. The work of Iyengar, Talhelm and Haidt adds a new layer to the study of polarization. In seminal work, scholars like Nolan McCarty, Jacob Hacker and Paul Pierson, political scientists at Princeton, Yale and Berkeley, respectively, have stressed the key role of external factors in deepening our political schism, including inequality, the nationalization of politics, immigration and the fast approaching moment when whites will no longer be in the majority. Residential neighborhoods are politically homogeneous as are social media networks. I suspect this is one of the principal reasons for the significantly increased rate of same-party marriages. In 1965, a national survey of married couples showed around sixty-five percent agreement among couples. By 2010, the agreement rate was near 90 percent. Competition, whether for racial equality or the NFL championship, is going to lead to personal negative feelings and without the balancing factor of other positive personal relations, you get the kind of intense dislike described in the article. In that way, politics is a sport just like any other.